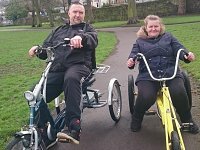 Project Chainge, a new initiative from cycling podcast The HKT Podcast, aims to raise £2,000 to buy specially adapted bikes to support children and adults with various difficulties and disabilities for Sheffield Cycling 4 All and the Mental Health Cycling Project. Thanks to a great response to our appeal for volunteers, Sheffield Cycling 4 All are starting cycling sessions on a Tuesday from 25th April from 10 to 3pm (term time only) alongside the Thursday sessions which run during the school holidays too. We’re still seeking volunteers to join the Tuesday team so do please get in touch if you’re interested.